Sincerely is an anthology of letters from the hugely popular Women of Letters events, run by the talented duo Marieke Hardy and Michaela McGuire. Started in 2010 as a small literary salon, Women of Letters has grown into a nationwide phenomenon of sold-out shows featuring an array of famous musicians, writers, actors and comedians. 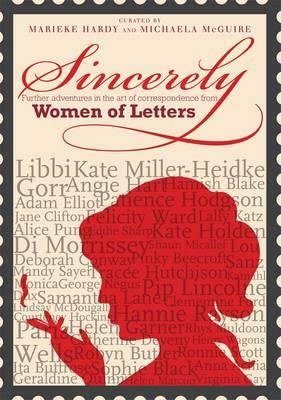 Sincerely gathers the letters read aloud at these events into an entertaining collection of missives from some of Australia’s most interesting women (and men). Rest assured, you don’t need to have attended a Women of Letters event – or even know anything about them – to enjoy reading Sincerely. The pieces are divided into a range of topics that includes love letters, apologies, complaints and treasured possessions. Letters are addressed to people as varied as Pauline Hanson, Buffy, Alanis Morissette and the Queen. Mothers and ex-lovers appear frequently. While some pieces are cheerfully light-hearted and jokey, others lay bare vulnerabilities, bad decisions, tragedy and torment. There are some strikingly honest and moving pieces of writing in Sincerely, revealing intimate details of the contributors’ lives, families and careers. Highlights of the collection include Loene Carmen’s letter to her grandmother’s silver lamé showgirl bikini, Helen Garner’s letter to a teacher who unexpectedly shaped her life, Kate Miller-Heidke’s letter to her 12-year-old self, Jacqui Payne’s fascinating letter to her six children, Angie Hart’s deliciously angry letter to her ex, and Emily Maguire’s lovely letter to all the girls she misjudged over the years. Reading Sincerely is a rather therapeutic experience – each new chapter brings with it good advice, potential life lessons and some inner reflection on what you might have written when faced with a topic such as ‘to the photo I wish had never been taken’. This is a perfect book to give to a loved one (hello Christmas! ); it has an impressive breadth of well-known contributors, plus stories and themes that will appeal to almost anyone. Also, it’s a damn good read. Nina Kenwood is the Online Manager of Readings.